Movement practices have always been a passion and a pathway to spirt for me. I grew up cultivating both a love of dance and walking in the woods; this was my way of finding inner peace and connecting to the great mystery. When I was introduced to yoga and meditation, I found a wonderful synthesis of mindful movement and a deep stillness that cultivated both a a sense of awareness and belonging. I am grateful to draw on my experience practicing yoga with Sofia Diaz in Boulder, studying Gabrielle Roth’s 5Rhythms, Qoya dance, and completing the 250-hour Teacher Training at ACY. I have been practicing yoga for the past twenty years, both on the mat and off the mat. This journey has helped me to realize that the gift of yoga is always there, teaching me new ways to be present, connected with the greater world, and to live with purpose. 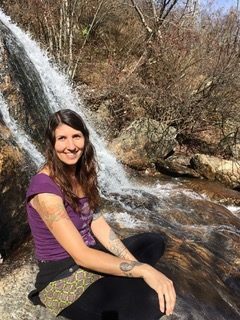 After these many years, I felt the calling to go deeper by taking the Teacher Training at Asheville Community Yoga. This training was a true gift and an amazing pathway to rediscover the practice of yoga for myself and to now have the joy in sharing it with others. I am honored to have the opportunity to be part of such a beautiful community dedicated to serving others. This vinyasa class will provide the opportunity for dynamic flow and a chance to slow down and deepen into poses. I love to move with the breath and to use this flow to release and to expand. The body is such a powerful vehicle for transformation and I hope this practice will provide challenge and also restore you physically and emotionally. I will also bring an awareness to alignment and core strength building. But beyond the physical practice I hope to provide a sanctuary where you can let go of the stress and rush of life, and find the peace and centeredness of the deeper yoga practice. I like to weave poetry and positive affirmations into the practice and to leave space for you to listen to your own inner knowing. This is the gem of awareness and connection that you can then take with you, off your mat, and into your life.